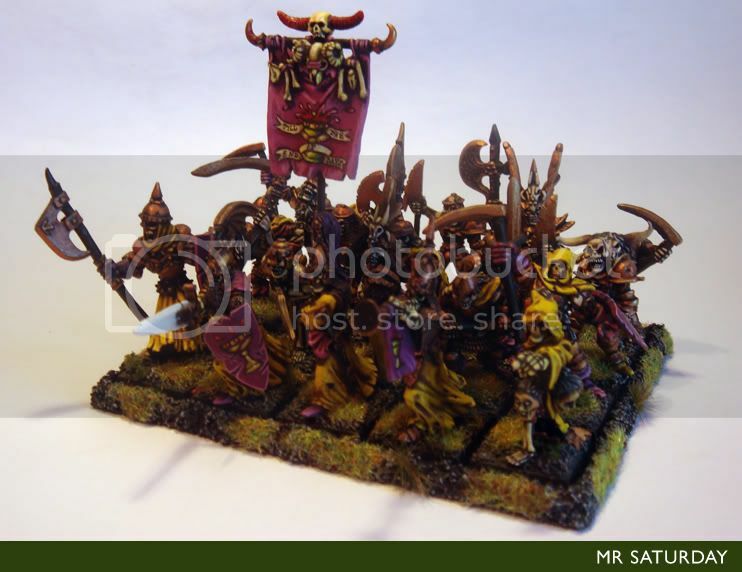 Seeing as this is primarily a painting forum, I thought I'll lash up a painted mini or two. 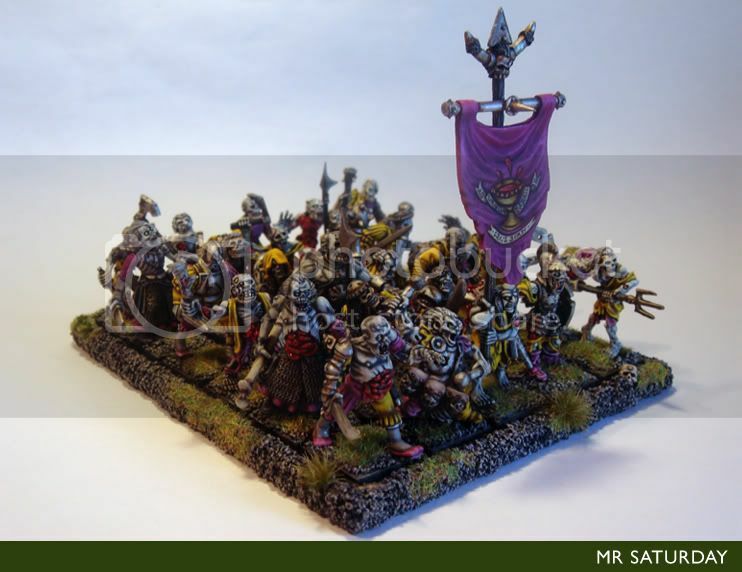 Here's one of my favourite units, my zombies. Wow, Mr. Saturday, that unit looks awesome! The painting is very crisp and eye-catching. 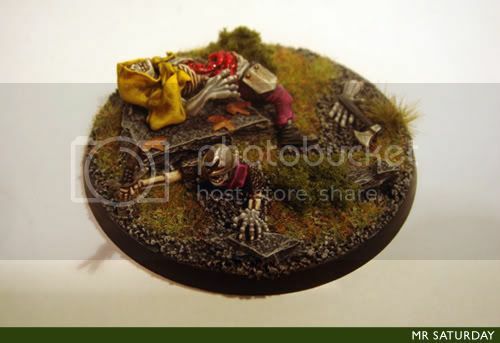 I can tell that you've incorporated more than just the GW Zombies in there - what other bits/models did you use? Also, the banner looks great! Could you give us a close up shot of it? Thanks very much. 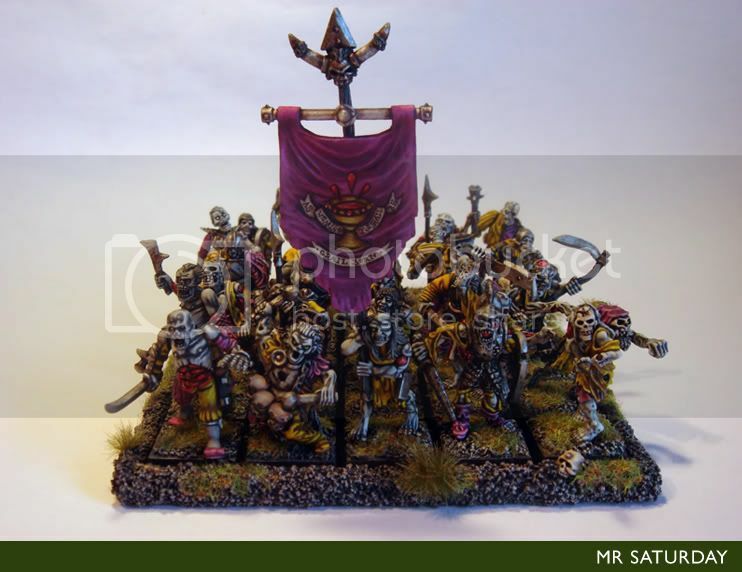 There's a few different zombie ranges indeed, as well as the gw plastics (mixed with empire, dark elf and various other plastic bits) there's old 1980's metal gw zombies, (I'm all about the old school) old Citadel Lord of the Rings dead men of Dunharrow and a couple of Grenadier minis. I have a front on shot of the banner, I'll upload a close-up later on. That is a really nice looking unit. Thanks Michael. Here's a mini I've just finished, a fimir fian champion for my fimir of Albion army. Wow, that is so cool! The paint job is very warm and looks great with the limited color palette. Is that a custom sculpt? Thanks! It is indeed a custom sculpt. The basic body is from the new gw savage orc kit. The tail and belly plate are from other plastic kits, and the head and hood are sculpted with green stuff. It's based on Jes Goodwin's limited edition fimir from the 80s. I used instant mould on the basic fimm head so I could make various head variants, I love that stuff. Wow, those Fimir are great! Love the sculpts, and the paintjob. You said you'll be using them for an Albion army? Is there a list for that, or is it proxy based? Cheers! The army fluff sets it in Albion, but there's no official list, though there are some fan lists out there. It's going to proxy for a warriors of chaos army, the fimm being warriors, fenbeasts as trolls, large fianna fimm as ogres and so on. Lovely zombies, they reall pop, and that banner is fantastic! I think I've seen your Albion Fimir on warseer correct? Top notch stuff. Cheers Peyton, I keep forgetting to put up a close-up! Yeah, the fimir is up on warseer. I have a lot threads running for the fimir army, some of the ideas folks have come up with are gold. 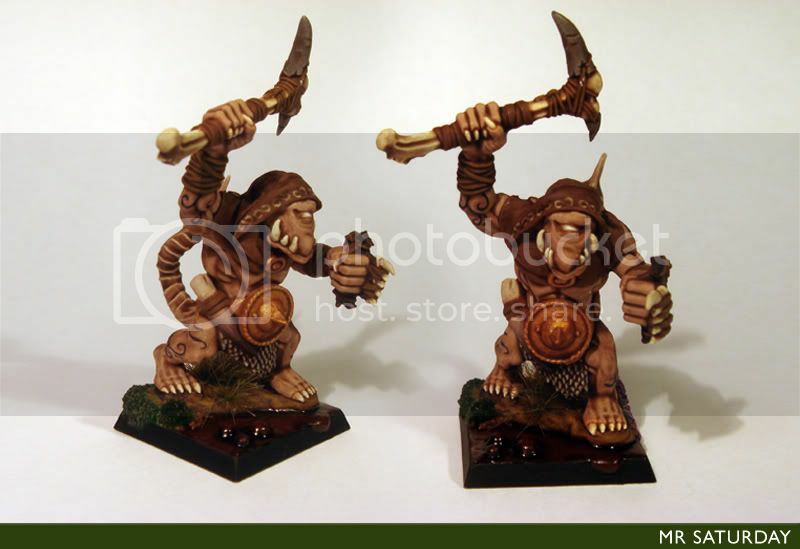 I heard today Forgeworld are doing new fimir warrior minis. WoOT! Ah, well i reckon you're probably better off converting yours out of savage orcs, it'll be a hell of a lot cheaper than buying the forgeworld ones! Tho conversions are great enough as is! Thanks Peyton, I will most certainly be continuing with the savage orc conversions, especially after all the effort! I reckon the FW ones will be monstrous infantry anyway. They might be useful for characters and such. I do have more of that vampire army indeed. It's not all done, I'm assembling two units of ghouls at the moment, but after that it'll be just a couple of characters, a vargulf (or in my case cyclopean undead giant) and it's ready to rock. I won't say done, as armies are never finished. 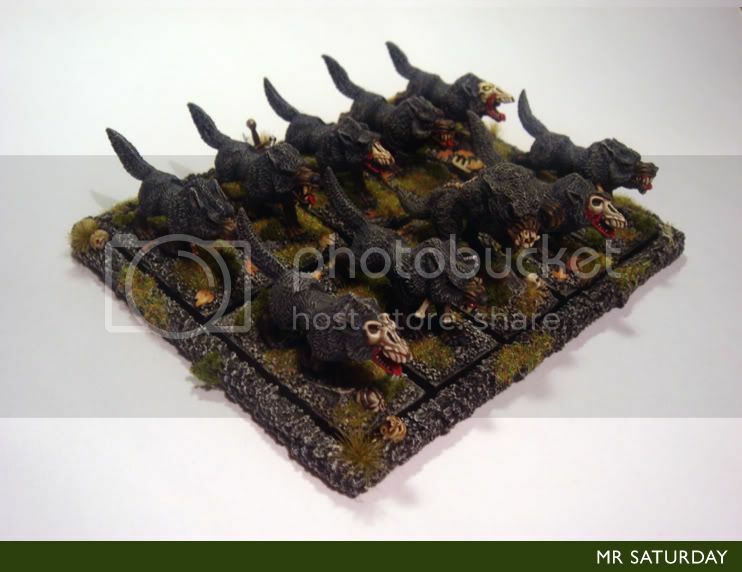 Here's one of my vamps and a couple of other units that I do have ready. Woah, that Ghoul test model is fantastic! The shading on the skin is spot on - very dark, gritty, and creepy. The blood smear is a nice effect as well. I really like the ghoul and the vampire. Thanks folks. 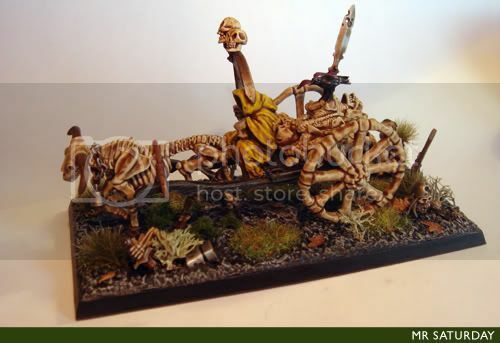 I've got a few plans for the ghouls units, I'm hoping to use the army builder bodyparts pack to work up a filler where the ghouls are feeding on the remains of a victim, and then fan out from there so ghouls closer to the filler are bloodier and have hunks of meat or parts from the body. I based the look of the ghoul on the vampires from 30 days of night, all crazy and gore-soaked. 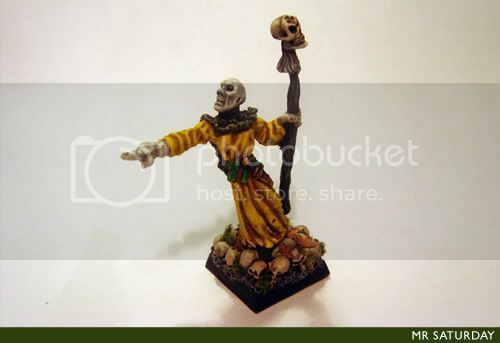 The vamp is an ooooollldd Ral Partha model. 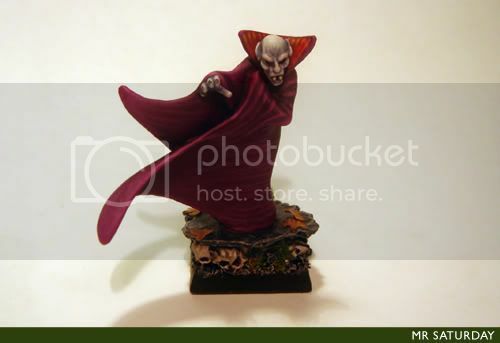 I really need to paint some new vamps, but this fellow has been with me a while now, and I do like the old nosferatu style vampires.